To preserve, conserve and restore the environment of Lochaber for the benefit of the local communities. To advance the education of Lochaber residents in the study of the environment and of waste management. The advancement of education, promotion of welfare and improvement of the conditions of those excluded from mainstream society in Lochaber through poverty, disability, race, unemployment or isolated location. The advancement of education through the provision of training and employment opportunities for such people primarily but not exclusively within the recycling and wider environmental sectors. The solar thermal and wood burning stoves were installed in 2001-2, the turbine in 2008, the PV system was added December 2011 and the heat pump in March 2013. The original house used an open fire for space heating and an immersion heater & back boiler for water heating. This was quickly replaced by the wood burning stove (which had been fork lifted into their campervan and manhandled back out!) which heated the whole house if the internal doors were left open so that the heat could filter through and the water by means of a back boiler. Additionally the heat generated stayed inside better with the layers of additional insulation that the owners had installed. The original construction was prefabricated concrete slabs, overlaid on the inside with wooden batons to which was fixed plasterboard lined with 1cm polystyrene. The owners added 50mm of Kingspan to the existing internal walls, and then a 10cm timber frame filled with rockwool and finally another layer of plasterboard or pine panelling. This made the internal dimensions of the rooms 15cm smaller, but on the plus side provided windowsills for growing plants on as well as the extra warmth. Additional to the internal insulation they also added cladding to the outside of the house that trapped a layer of air between the wood and the concrete adding extra insulation and creating a home for some pipistrelle bats! The solar thermal panels provide hot water for the household during the months when they don’t want a fire on in their front room, which saves them having to turn the immersion heater on. The extension to the house was built in 2001 and at the time of construction the recommended heating source was night storage heaters. Although the two wood burning stoves (one in the extension and one in the main house) heat the house to sufficient levels the owners recently decided to install an air-to-air heat pump, with four outlets, throughout the house. 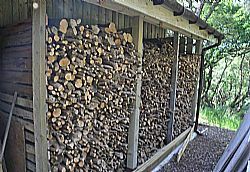 This will provide heat on days when they perhaps don’t want a fire or for when they get too old to source wood themselves. The wind turbine and solar PV panels provide replacement electricity from the mains electricity and allow the owners to sell their unused electricity back to the grid. The wind turbine required planning permission. This was granted without issue. A site for the wind turbine was identified and the base prepared by fitting rockbolts directly to the bedrock, Three inverters were required and these sit in a handy cupboard in Dave’s office, actually giving off a small amount of heat, assisting with warming the office. When the turbine was first installed it had an irritating squealing noise which was soon identified as faulty blades, and these were replaced very quickly. Now the turbine just makes a small amount of sound that cannot be heard from indoors. Watch the video below to hear the noise levels. A Native Woodland Scheme grant of around £12,000 was awarded to the owners to eliminate the rhododendron from the plot. This meant that with the help of friends the land could be cleared and the stove kept in supply of wood for many years to come. The Turbine requires and annual service which costs around £300. Since Dave sorted the issue with the tank thermometers, the solar thermal panels have not required any additional work. The owner has an import/export meter that currently shows that they export 50% more electricity than they import. This meter has been beneficial as without one the government presume you will export only 50% of you electricity generation- which would have meant that Dave and Jenny lost out on export tariffs. In 2012 8480kWh were generated, 2605kWh were used directly, 5875kWh exported, and 2434kWh imported from the grid (when dark or calm). 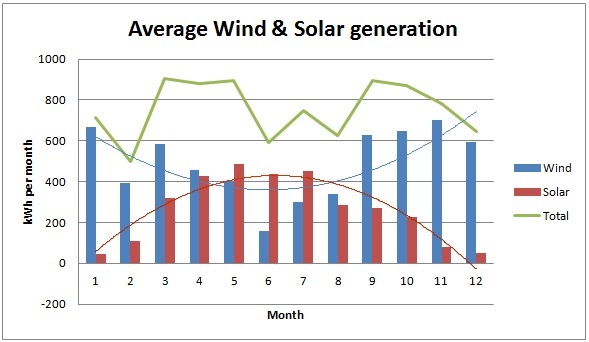 The graph below shows the average monthly generation and the average total generation- these figures are based on the wind records from 2008 and the solar records from 2011. What can I recycle in Lochaber?